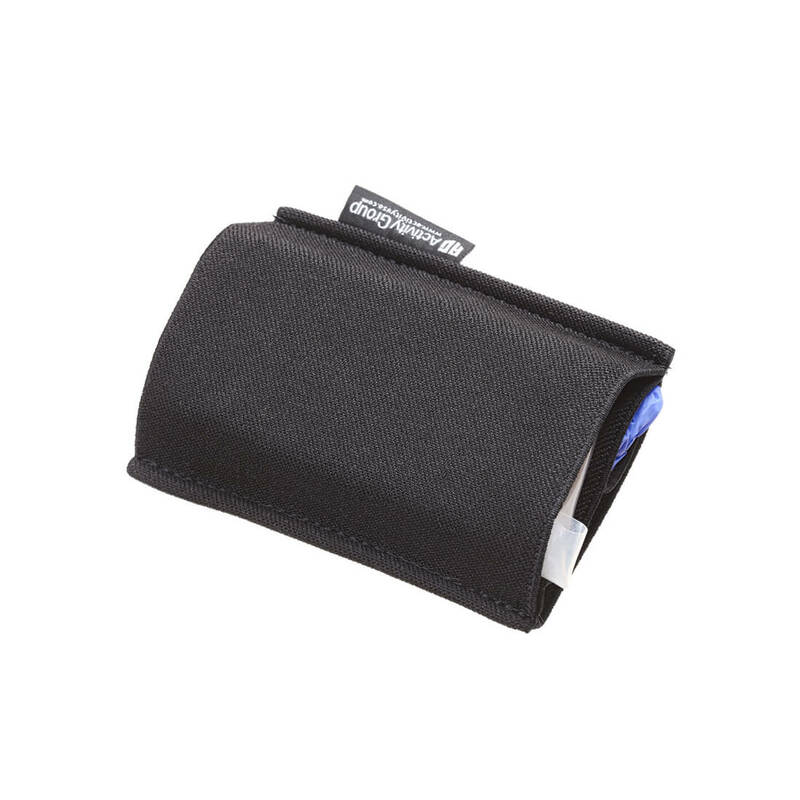 Elastic sleeve with 3 compartments, two large and one for gloves. 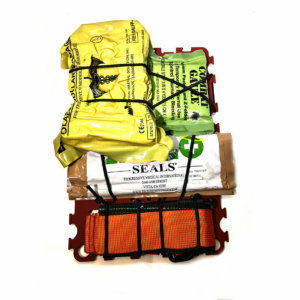 Contents: 1 H&H Flat Compressed Gauze, 1 H&H Mini Compression Bandage, 1 pair nitrile gloves, 1 3×8 WoundClot Gauze (or change to Celox&reg; or QuickClot&reg;). Reusable, one-hand operable, and user-configurable. * Click “Clear” on options to purchase empty sleeve. 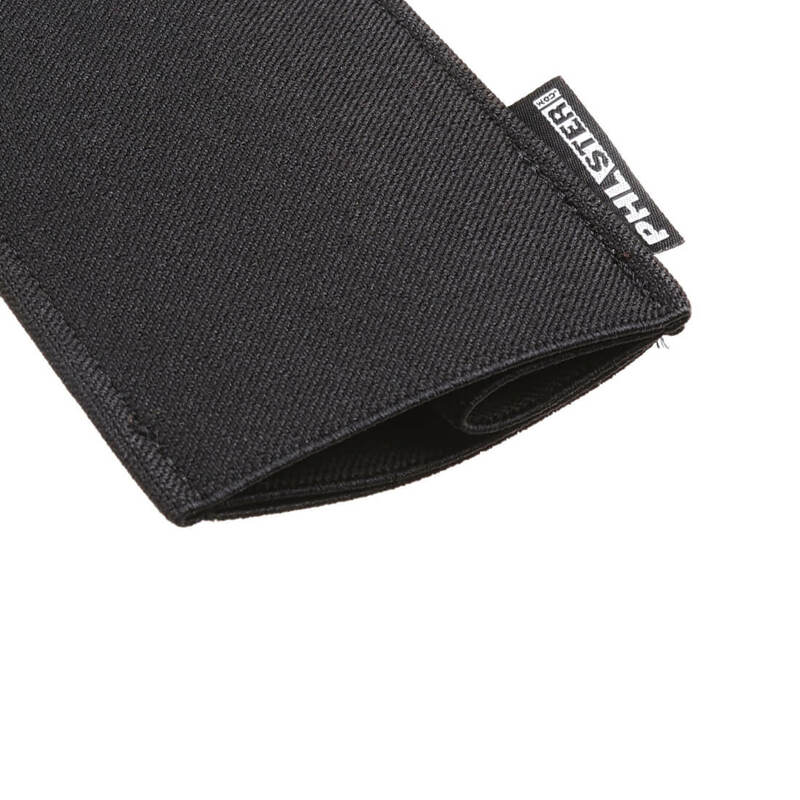 The Pocket Emergency Wallet (PEW) is an elastic sleeve, built to our specifications by Snake Eater Tactical, sewn with three compartments, two for medical items and one narrow pocket for gloves, protecting your sealed gauze and bandages from abrasion and keeping them compressed and compact for pocket carry, while allowing for single handed access and deployment of the contents. 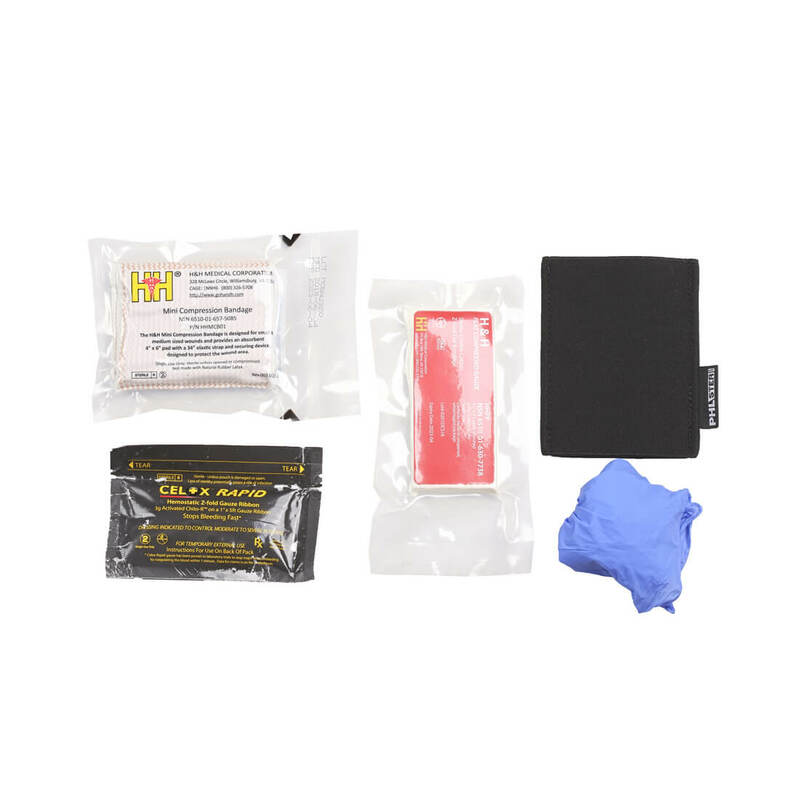 The PEW includes one pair of nitrile gloves, an H&H Mini Compression Bandage, and an H&H Flat Compressed Gauze. 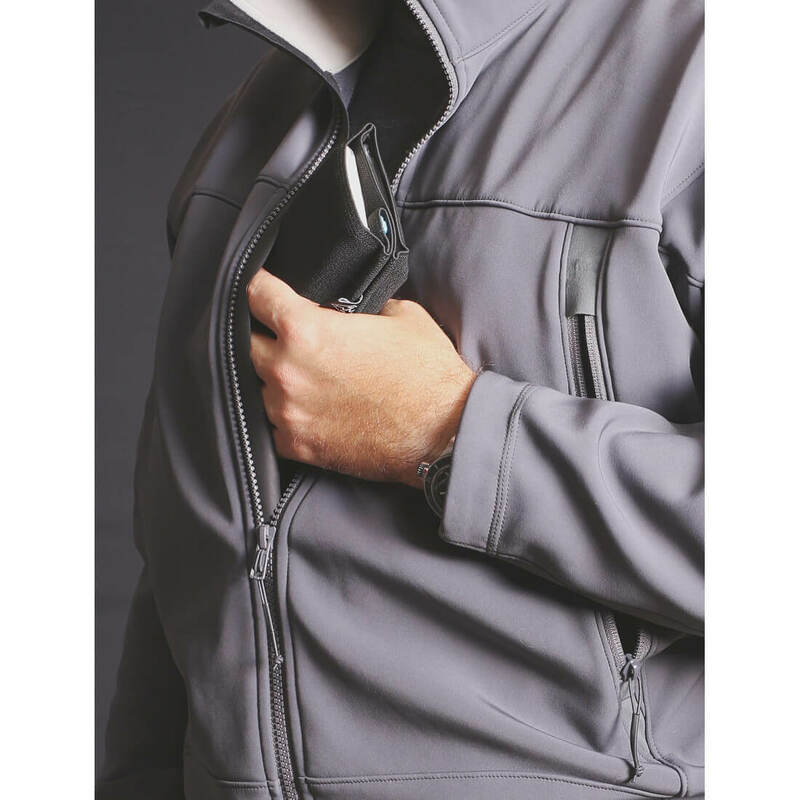 With our typical focus on efficient minimalism and affordability, we designed this kit to provide emergency bleeding control within a context where EMS, backup, or rapid exfiltration to a hospital are available. As is the case with a tourniquet, having these items on your person is vastly superior to having them elsewhere. 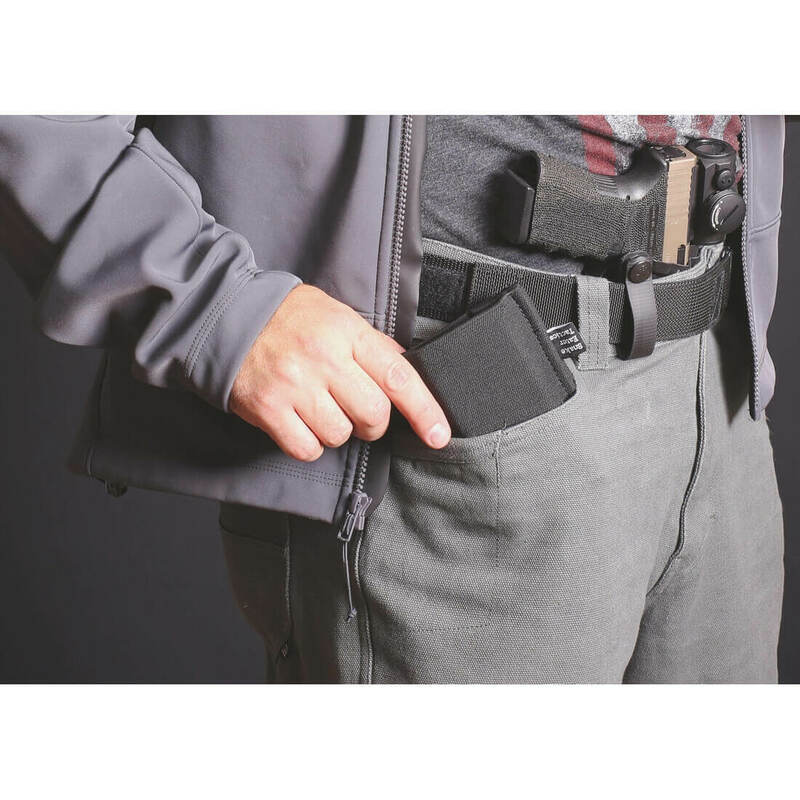 We designed the PEW around the premise that it will serve as a low profile/convenient EDC toolkit to reach a higher level of care by addressing the kind of massive hemorrhage which can be lethal within an expected response time. 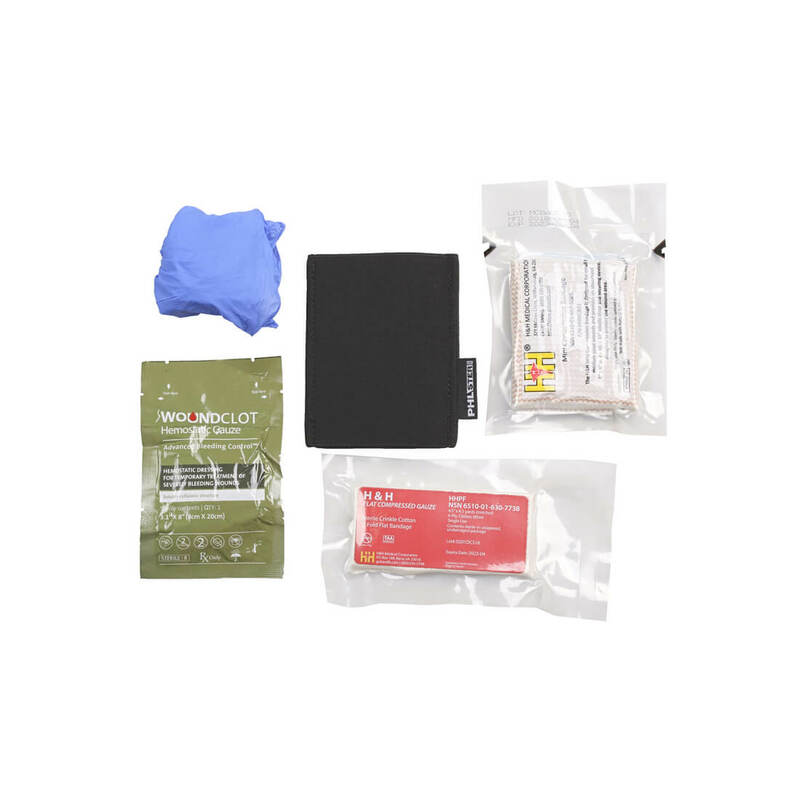 Rather than paring down or miniaturizing a military IFAK to fit this role, we started with a blank slate and asked, “What are the barest essentials to save a life from massive hemorrhage in a functioning urban or suburban setting?” We asked medics, first responders, and tac-med instructors, “If you could only carry two items beyond your tourniquet, what would they be?” With these strict criteria, we were able to build a solution to fit your pocket, both in terms of size profile and budget, the two biggest obstacles to individual medical EDC. We also offer WoundClot, advanced hemostatic gauze, as an ultra-slim and affordable option to add a hemostatic agent to this kit. Selecting this option for your kit adds no additional bulk, due to the thin profile of this component. Due to its new-generation technology, WoundClot rapidly coagulates and clots while requiring less continual pressure application. Small diameter penetrations might require only a superficial application while the 3×8 inch gauze can be packed into larger wounds and followed up with conventional gauze. The PEW is universal and user-configurable, as well. You aren’t married to our choice of components. 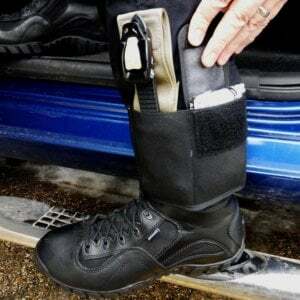 Empty PEW sleeves are available if you prefer to stock your own kit. 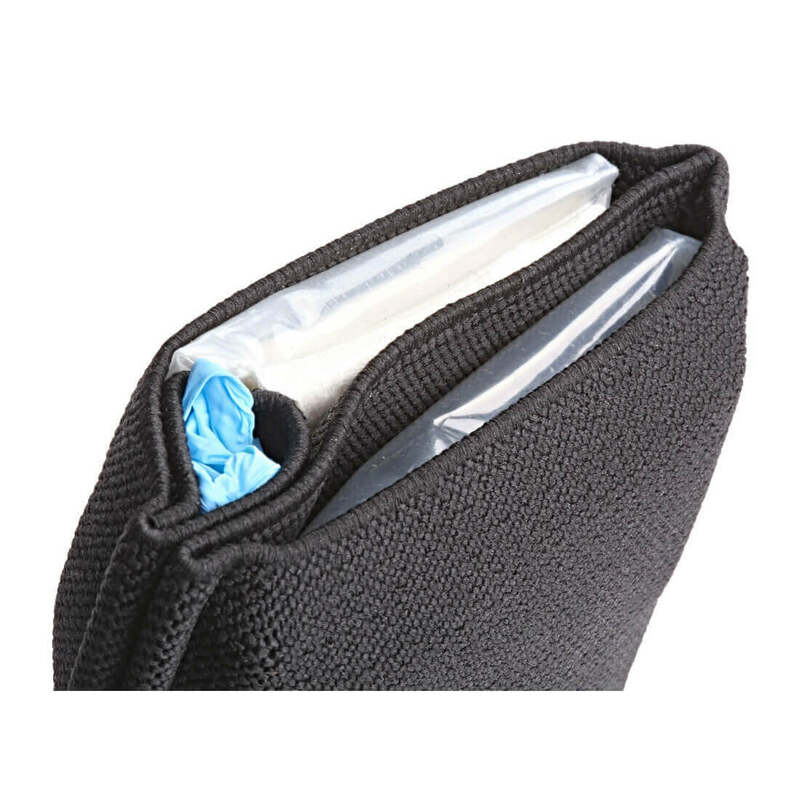 The PEW fits Celox Rapid gauze, Quick Clot Combat Gauze, Fox chest seals, NAR HyFin compact chest seals, SWAT-T tourniquets, and many other items (although, the size and shape of the PEW may change depending on the contents and how they’re folded and stowed). 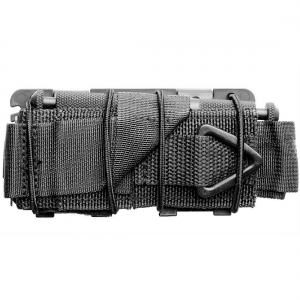 Additionally, unlike a vacuum-sealed plastic pouch, the PEW is reusable, allowing you to train and practice with the carrier. 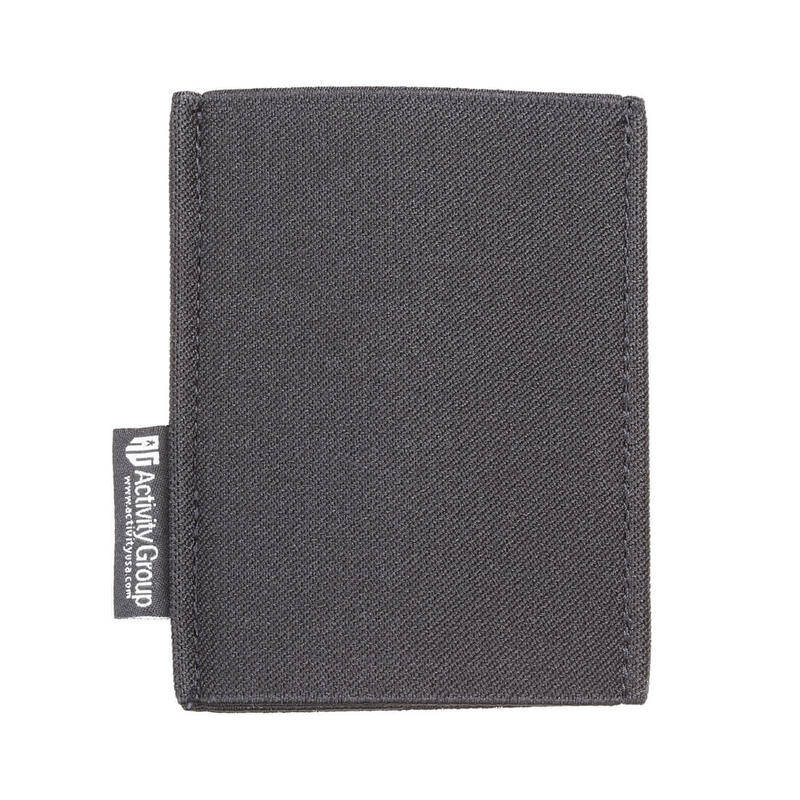 These items are currently under continuous replenishment and any backorders should ship in about 1 to 2 weeks, or less. None, QuickClot® Bleeding Control Dressing, Celox® Rapid Ribbon, WoundClot® 3" x 8"
Another outstanding product. Another item each member of my family keeps in their respective purses, diaper bags, and back packs. 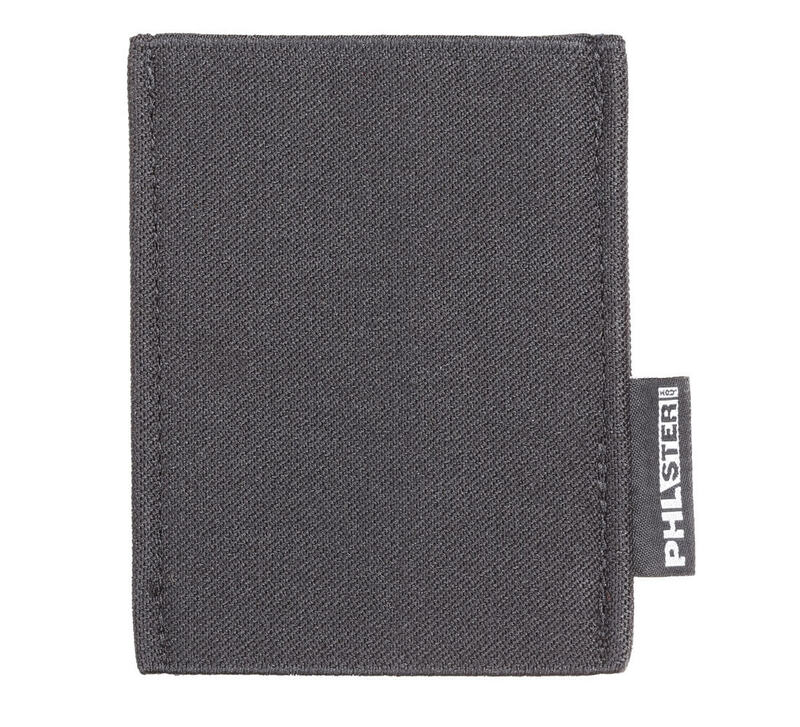 I keep one in my back pack in addition to my PHLster ankle kit. I add a couple small tegaderms as a hasty miniature chest seal and it’s good to go.